Since we first posted in our Pinterest DIY Series: crayon art blog, we had loads of questions asking me 'how do you actually make that?' so I've decided to take one for the team (plus we promised will be having a crack at each Pinterest DIY Project of the Month) and I got my craft on, so now I can walk you through what I did and how it turned out. I am pretty excited about the canvas I picked up even though it was nothing fancy (just from my local dollar store) and let me tell you it’s a big’n’. But I have always said: go big, or go home. Of course, if you are crafting along, you don't have to buy a big one. You can get SO many different sizes and even shapes now, that you can really get creative with your blank canvas. I also bought two boxes of Crayola crayons – just the thin ones, as I thought they would melt easier than the dollar store ones and they were on special (thanks back-to-school sales!) 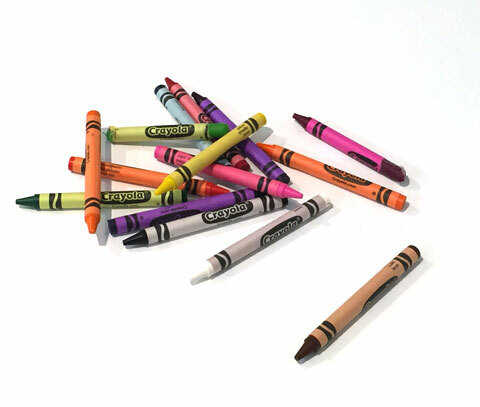 When I got my loot home and quarantined them from the kids, I took off the paper and broke each colour up into small pieces to make mixing and melting the crayon easier. Then I put the crayon pieces in a pattern around the canvas ready for melting. My first lesson for you is - no matter how excited you are about pulling the hairdryer out of the bathroom and giving her a workout (I was so excited because I couldn't remember the last time I used it) - melt the crayon with the oven first. I tried with just the hairdryer first and I found I was chasing little hard bits of crayon around the canvas which in turn led to chasing them around the kitchen and scraping little bits of partially melted wax off my floor (candle-makers, I salute you!) So before giving your hairdryer a work out, use your oven to start the melting process. You remember how I said go big or go home? Well, then I was at home with this massive canvas, trying to fit it into my oven all at once. Was this massive canvas a good decision? Maybe not, but I found a way to work it by doing sections of the canvas at a time. I placed some of the broken crayons in a corner (not too close to the edge) and put that corner in the oven. 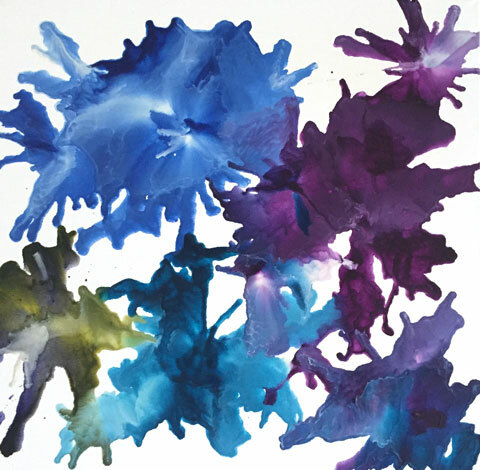 As the crayon pieces are melting – the canvas itself is also heating up and it really won’t take too long to scorch, so keep a super-close eye on it. If you see it starting to smoke - you've probably gone too far. You don’t need the crayon fully melted, just enough so it's stuck to the canvas and not going anywhere if you tip it. Once you take the canvas out of the oven you need to get your skates on so make sure your hair dryer is handy and ready to go. I used the hottest setting on the hair dryer with the lowest speed at the start to really get all the rest of the pieces of crayon melted and then cranked it to high speed (still on high heat) to move the design around the board. Be careful not to get your hair dryer to close to the canvas as you will get crayon all over it – rookie mistake – I made it, so you don’t have to). Here's where you can really get creative. You can do some great colour combos and putting a light and a dark together gives you some great blending. Once you have finished one area of your canvas, move to the next. 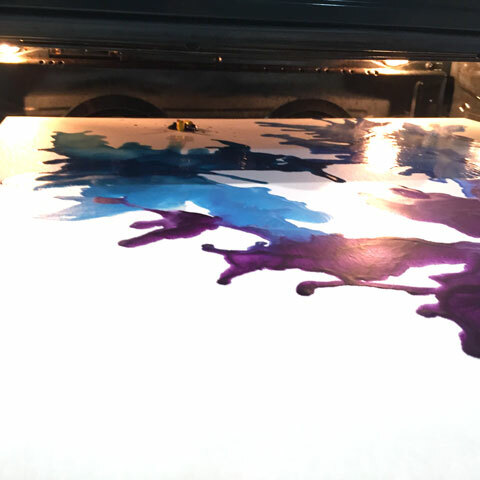 An important thing to remember when you put the canvas back in to the oven if you bought a monster canvas like I did is, the first lot of crayon in your beautiful design will re-melt with the radiant heat of the oven. 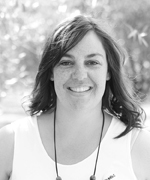 But don’t freak out – as long as you don’t tip the canvas too much or use the hair dryer on that previous area the design will stay as you originally had it. You keep continuing this step until you are happy with the end result and your cray-ation (see what I did there?) is complete. 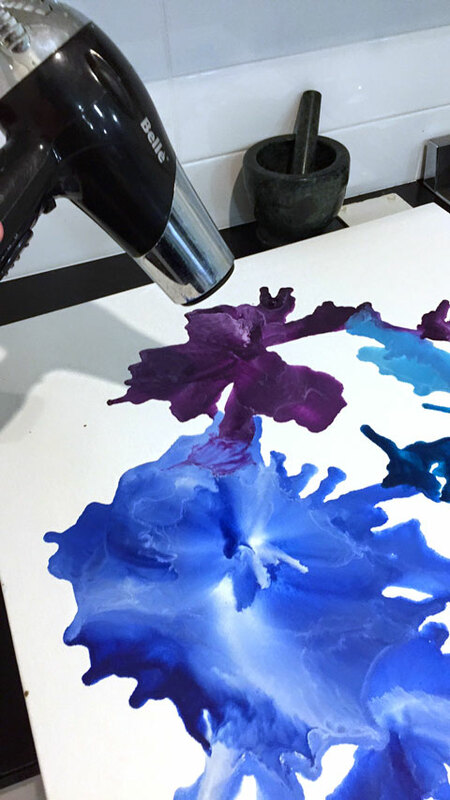 A note to all virgin melted crayon art fans - your hairdryer is going to get a serious work out. Don’t panic if you take your canvas out of the oven and then you go to use the hairdryer and it's …. well…. dead. It’s probably not dead, and it’s most likely just over heated. Try not to panic too much, or scream like I did. I may have placed the hair dryer in the freezer to cool it down faster – and it worked – and then I was back at it, creating art! And here it is, my masterpiece! Beautiful, no? 5)	Hang and admire your artwork… and share it with us on social media! This project requires the use of heat so if you’re going to get the kids involved, make sure they’re well supervised to protect those little fingers from scalding hot wax, ovens and hairdryers. 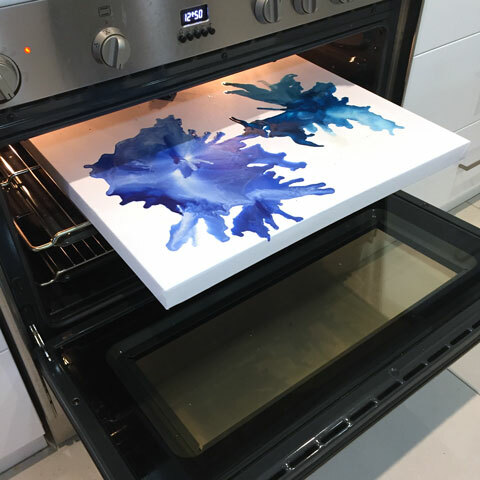 Never walk away from the oven while your art work is inside as it may catch fire quickly. If you've had a go at this month's Pinterest DIY, we'd love to see it. There’s still a Made It voucher up for grabs so share your Crayation (that’s a thing now) on Instagram or Facebook before the end of February and make sure you tag us @madeit so we can revel in your artistic genius!